Note: this trail can also be started at the Lightning Lake day-use area. This will add about 5 km or 1-1.5 hrs to the round trip. The Lightning Lakes Chain Trail is a pleasant walk along the shores of four lakes: Lightning, Flash, Strike and Thunder. This lake valley was carved out thousands of years ago when sediments from receding glaciers built up areas of the valley floor, choking off the meltwater to form the lakes. Starting at Spruce Bay Beach the 15 minute walk along the fire access road takes you to the Skyline and Lakes trail junction. Shortly after this point the trail narrows and the sounds of the road and campground fade away. At your feet the forest floor is brightened by Queen’s cup and bunchberry, known in early summer by their blue and red berries. Both of these berries are poisonous, but watch for edible thimbleberry, wild currant and blueberries all summer. Overhead, Engelmann spruce, sub-alpine fir and lodgepole pine act as umbrellas along the trail. The spruce is easy to identify, its needles are sharp to the touch and its bark is very flaky. As you walk, look for spruce trunks that have had flakes chipped off by hungry three-toed woodpeckers as they look for insects. You can also see piles of “cone-flakes” on stumps or on fallen logs. These “lunch tables” were created by red squirrels whose winter supply of cones are stored in middens (holes) among the tree roots. 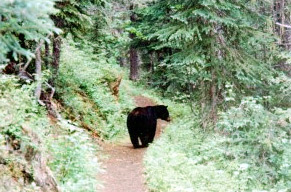 In about forty minutes (3 km) you will reach the end of Lightning Lake where, in the late afternoon and evening, beaver can be spotted. At the fork in the trail, the right takes you onto the other lakes. 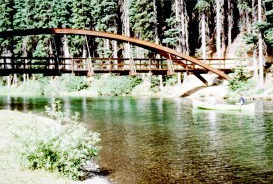 In June, take the trail on the left, down to the little foot bridge, and see rainbow trout spawning. Proceeding along the right fork of the trail, Flash Lake soon appears and a few minutes later you cross the first of several small rock slides. Look and listen for the tiny pika. It looks very much like a guinea pig and has a sharp, high-pitched nasal warning cry. At the western end of the lake you may return by the same route or by crossing a small bridge to the left, following the trail back on the other side of the lake. Otherwise as you continue on the Lake Chain Trail, Flash Lake becomes thick with grasses and sedges. Look carefully here and you will discover a number of canals make by beavers. In order to maintain a constant water level in the canals, notice how these ingenious engineers have also built a series of locks. The beaver dam is located at the western outflow of the lake. A further 30 minutes (2 km) will bring you to Strike Lake and another 10 minutes down the trail will bring you to the wilderness campsite. The campsite is nestled in a protective grove of tall Engelmann Spruce trees. Camping is restricted to this site. For day hikers, the campsite is a good spot to stop for lunch before continuing to Thunder Lake. While you are resting here, look out over the water for a little grey bird called a dipper. Propelled by its wings, the dipper can run under water and catch aquatic insects and tiny fish. Also watch for the Rufous hummingbirds that nest in the area. Fill your water bottle before continuing and please remember to pack out your garbage. Other hikers will appreciate your efforts! The 3 km trail to Thunder Lake leaves from the southwest end of the wilderness site. At first, the trail winds through the shady forest, surrounded by the moisture-loving plants you have seen since beginning the hike. After about 10 minutes, you will reach the dryer scree slopes, where fireweed grows in profusion. Notice that the plants are small and grow in clumps or mats, in order to preserve moisture and to avoid the wind on the dry rocky slopes. After about half an hour of picking your way across the slippery (even when dry) rocks, the deep turquoise-blue of Thunder Lake is finally visible. If you decide to carry on proceed with caution, as this is a slide hazard area. This is the end of the Lightning Lakes Chain Trail and time to turn back. As you return, remember to watch for beaver, mule deer and many birds found in this area. Have a great day!